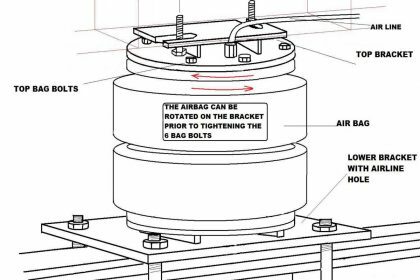 A common issue for the DIY install of airbag load assist kits is how to align the top and bottom plates. Start by assembling the Airbags by bolting on the top and bottom end plates to the alloy rings on the air bags with the 6 threaded nuts and bolts and spring washers [top and bottom] supplied in the kit. It's important to make sure you leave the 6 bolts on each end just loose enough to be able to twist the top and bottom plate around on the bag [this moves the aluminium ring with it] to allow for final alignment during the fitting process. [refer to the diagram below]. Once aligned properly, tension the bolts. Don’t over tighten as this can cause leaks. Tighten all bag bolts evenly ensuring the gap is even all the way around and should end up around 1 -1.5mm. If you have a problem with air leaking around the alloy ring area, remove the 6 bag bolts and rotate the alloy ring 90 degrees to get a better seal. The alloy ring is designed to bite into the bag bellow to seal it, that’s why its important to tighten bolts as mentioned above. When installed, initially inflate to 80-100psi and then reduce pressure to a normal level before using [normal varies depending on vehicle and load etc., and you will find what is right for you]. This is important to allow the rings to “bite” into the rubber and give a good seal.